Ingrid Buschmann, Freunde Gute Musik Berlin e.V. 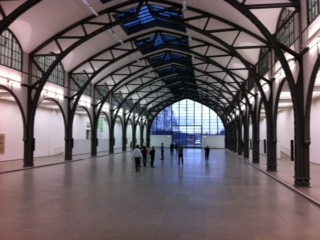 For the historic hall of the Hamburger Bahnhof, Susan Philipsz has designed a sound installation that relates both to the building’s former function as a railway station and to the architectonic structure of the hall with its 12archways. 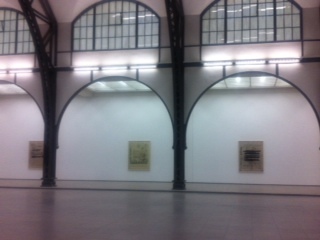 The artist connects the former railway station – a place of departure and arrival, of parting and return – with the eventful life of the composer Hanns Eisler (1898-1962), who lived in Berlin in the 1020s and 1950s. The artist has created three pieces, based on three different musical compositions for film by Eisler, that play one after the other, each tone of the compositions wa recorded separately in the studio. In the installation, the tones are distributed among the 24 loudspeakers installed along the entire length of the historic hall. Each loudspeaker is assigned a tone on he chromatic scale, so that each of the instrumental voices becomes spatialized and wanders through the hall.